You see, Erastus may have never made it to his grave. In between his ascribed date(s) of death, and the advertised date of his burial, something changed. And, as much as it would be ever so convenient for me to say that Erastus was the victim of late nineteenth-century Fake News (or even better – international intrigue! ), the newspaper accounts are pretty clear. They appear to accurately recount the event of his death and burial. The accounts give a straightforward chronology, leading from his “impaired date” of death to the “acts” surrounding his funeral services. So what then happened to Erastus? I wish I knew. Port Huron Daily Times, Wednesday, 18 September 1889. Poor Erastus, even from the beginning any date of death gets wonky. His date of death is only implied, from the newspaper account dated Wednesday, 18 September 1889, which says he was buried “last Sunday,” meaning he was buried on 15 September… (and died when???). However, the whole affair with Erastus’s date of death isn’t that easy – as later records show him (quite impossibly) having died the following November. I have to say, it must be kind of an unusual feeling to have your obit. come out before you pass away – and then to have your grave site go missing afterwards. Of course, we all know it didn’t happen that way – no matter how it seems. A couple of years ago, one of Erastus’s descendants tried to take this mystery on. He did a great job, too, as at the time even documenting the year of Erastus’s death was a feat in itself. 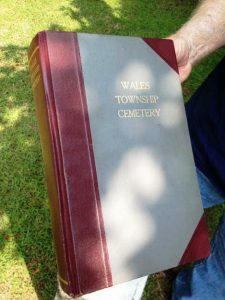 Accompanied by his wife, a tenacious researcher, my Lee cousin scoured newspaper accounts and libraries, traveling with his family to Wales Township and to Mt. Pleasant Cemetery. I can’t help but feel for my cousin; he was, after all, so well-armed with a solid newspaper account of the funeral service and a fearless gal Friday at his side. How could they not believe those statements in print as to where they had placed the old “pioneer” that Sunday in September of 1889? When they arrived at Mt. Pleasant Cemetery, and went to meet with the sexton, the only thing that they could discover was that yes, Erastus had indeed purchased a plot there. The sexton even took them to it, presenting the plot to my poor cousin, but alas, the sexton had no record of anyone ever being buried in the plot. No stone or written record of a burial existed, leaving nothing there (for all intents and purposes) but the vacant crypt of Erastus Lee. I can see that crow laughing at us now, as it begins to fly away from us, the mortal fools. So I let the old crow circle Mt. Pleasant Cemetery from time to time. I find it’s good for both of us to stretch our mental wings in going back there, just to see if something has changed, or if the pioneer has decided it’s time for us to know more about his final resting place. I’m very grateful to my Michigan cousins for making the trip and attempting to (just figuratively) dig up old Erastus. I owe them – because I’ll never get there. And true enough too, there really isn’t any way of knowing what happened to Erastus beyond having faith in the newspaper account of where he was buried that summer. In the meantime though, I will let that crow keep watch, and do my best to make sure that nobody forgets old Erastus Lee. I like to think he’ll become the stuff of St. Clair County legends, all the while keeping a look-out from his hidden burial place. 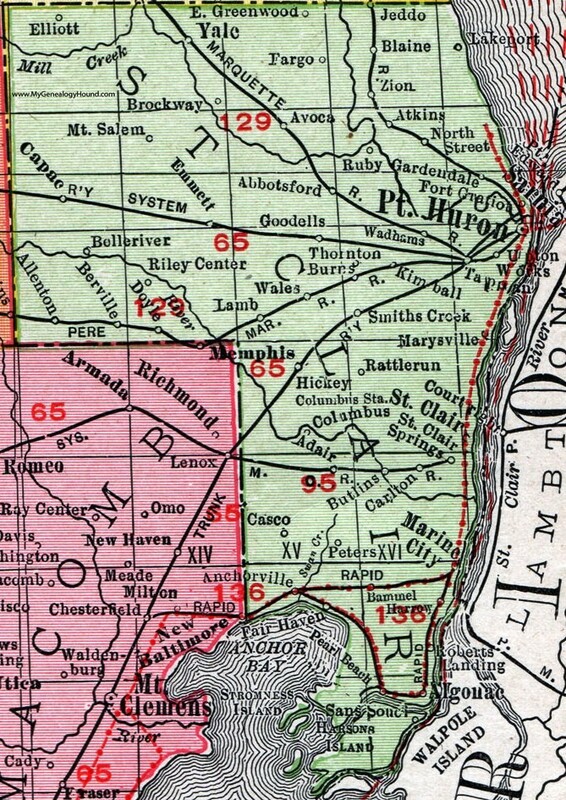 Wales Township, St. Clair County, Michigan. 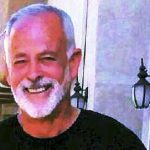 Jeff Record, Lost but not forgotten, Vita Brevis, 31 March 2017. 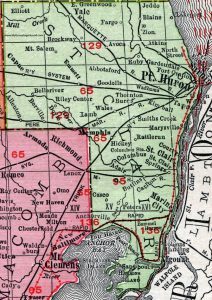 Calculated to be ‘near’ Sunday, 15 September 1889 if the Port Huron Daily times is correct, or 8 November 1889 as per Michigan, Death Records, 1867–1950 (Ancestry.com). Port Huron Daily Times, Wednesday, 18 September 1889, 1, for the obituary of Erastus Lee, images courtesy of Mike and Ailam Lee. Janet – My apologies! Footnote six is in error …. and should be missing….unlike old Erastus Lee! This is a little discussed source of angst, so thank you for writing so eloquently about it. I lucked upon my great great grandmothers interment, and subsequent reburial in another state a few years later by a chance encounter with undertaker’s removal and transport records. But I have never found an unrelated great grandfather. I have a date narrowed to a year, my own childhood memories and family anecdotes of going to his grave at the old Catholic Cemetery, but no church records, no newspaper notice, and it was only 1919, you’d think there would be massive records. I know there was a falling out with the church around this time. Was he excommunicated and buried in unhallowed ground in some adjacent pasture in an unmarked grave as they did in Ireland? Is it a records error? Something simple as a name miss-hearing? Did he just leave home and abandon his family? Leaving us all to actually visit only his sister at the cemetery? His young daughter, dead 6 years earlier, is meant to be buried there too, and is not. Is that a clue? Funerals are not always concurrent to burials and deaths are not reported locally only. Vermont Vitals recorded all the emmigrants of Vermont families, reporting as if they were all still in Vermont when those new lives were beginning, ending and being recorded in western NY. This problem is so ubiquitous, and Find A Grave so thoroughly laced with wrong info, it is more than occasionally impossible to record anything other than the minimal info on in-situ old gravestones. Some families have recently taken to making graven memorials with their whole – incorrectly researched – family tree etched into stone. And when you have something as explicit as your pictorial footnote 6, with no record of interment, that is so irritatingly close to a closed case how can we live with that? I’d look next for undertaker’s notebooks. Maybe you can find that on the death certificate. I’m betting the number of times graves were reused has something to do with it. I expect old records were burned to accommodate these activities. That would be a great research paper in itself. Jane, Thank you for your kind words…Yes! It does seem to be a problem many of us share in common. Your story about your great grandfather (and our similar situations) really rings close to my heart. I wish you great success in finding him! And vitals records from Vermont to Western New York? Where do I start !!! If you had money to burn, I suppose you could use ground-penetrating imagery to see whether anyone is in that grave. Like you, I suspect slipshod record keeping. Why would someone buy a plot, and have a newspaper account that he was buried in that cemetery, but not actually get buried in it? I have a similar mystery, in that my Athearn great-great-grandfather is missing. My great-grandfather wrote that his parents were buried together in Anaheim Cemetery, and he remembered his father’s interment there when he was seven (his mother having died three years prior). However, the online cemetery records list only my great-great-grandmother and her first husband, buried two graves away from her. When I wrote to the cemetery offices, they indicated that their records indicate that my great-grandfather’s remains were exhumed and “sent to Los Angeles” a few years later. It’s curious that his only surviving son didn’t know about this; one can only wonder who, why, where, and when. The greatest irony is that the missing man was on the cemetery board! What a story here! – I’d love to help you with this “cold case.” Have you tried the California Society of Pioneers? They have some northern California burial transfer records. I’ve met a helpful soul there. Let me know if you’d like the contact info. Your story drew me in immediately. Thank you for demonstrating how stories about our ancestors can be informative as well as entertaining. Hope you someday find Erastus’s stone. Linda, You are too kind….I should probably be sent to the back of the classroom for “telling tales” out of school….but like you, I think genealogy should also be more than just dry facts….After all, those dry facts were once “people” – and last I checked – so are we! Your posts always make me smile! I hope your buddy, the crow, spots a useful clue for you, and Erastus’ burial story will be resolved! Seems like many of us have these strange burial problems to attempt solve. I know I do! I sure appreciate your kind words! I think you (and your crow) tell a very interesting tale. You bring these people & circumstances to life with such colorful stories and I love reading your writing. Thanks cousin! Jeff, This is another good one! :D) Adding humor to frustration does reduce the frustration part sometimes……… for me anyway. Thanks again. Well done, Jeff. Interesting and informative as usual. My dad’s family obsessed about who was going to be buried with whom and what would happen to family number 13 in the 12 grave lot. Despite all the planning and names carved on the stone, some relatives moved away, and it was an matter of expediency to be buried elsewhere. On the opposite end of the spectrum, while walking through a cemetery in Wareham, MA, I noticed a new name added to a family stone. Curious, I went to the cemetery office, and they had no idea of how the person got into that grave! My daughter lives in Wales township. If you have any additional research that you would like done, she told me that she would be glad to do it. She is a retired police officer there and knows the authorities, who might be able to answer some questions. Of course none of them were around when your ancestor was.